I’ve been home now for about two weeks after spending a wonderful bird-filled month at the Long Point Bird Observatory in Ontario. I had such a great time at Long Point (it’s hard not to!) with the other volunteers, banders in charge, and all of the birding and banding. 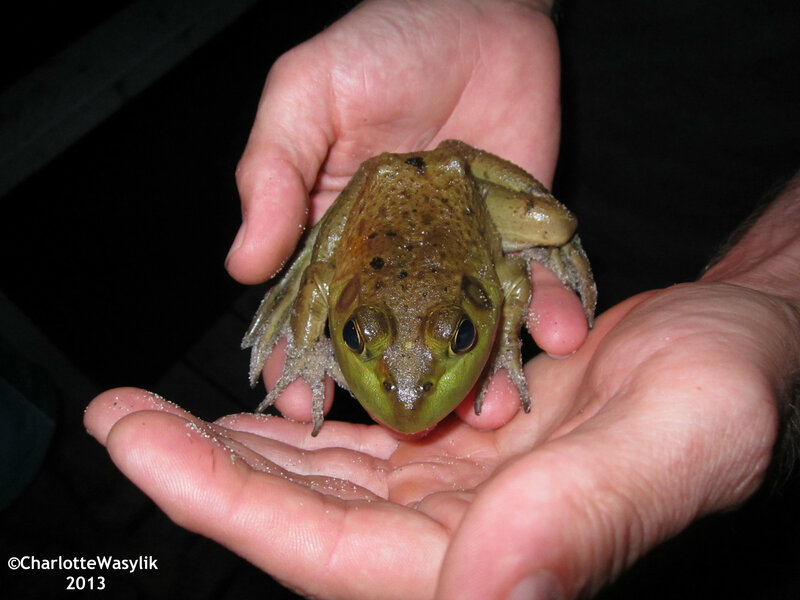 And I learned so much about banding, molt, neat tricks for aging and sexing certain species, and also how much hard work goes toward keeping all three banding stations going. I miss everyone at LPBO very much lot and am envious of all the amazing birds that have been banded and seen since my departure. 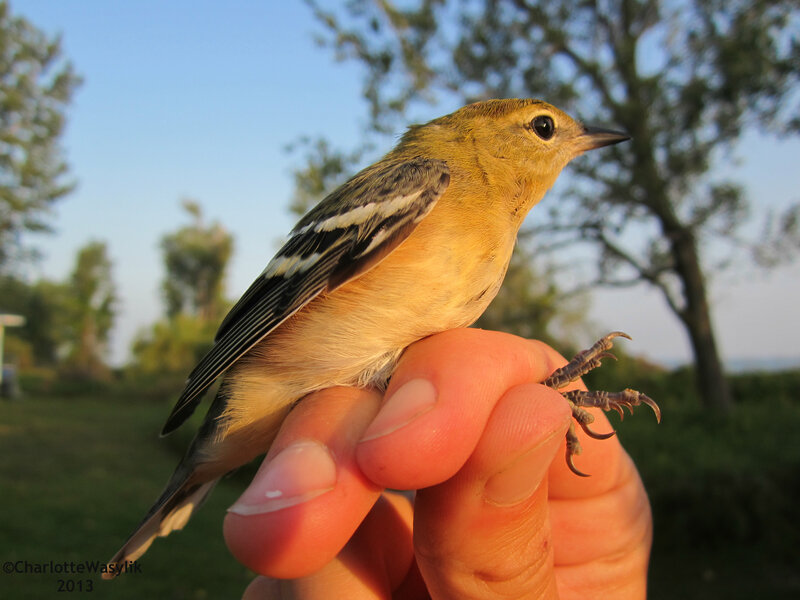 Some of my favorite species I banded were a Semipalmated Plover, a Sharp-shinned Hawk, an Orange-crowned Warbler, countless Swainson’s Thrushes, a Black-billed Cuckoo, an American Goldfinch, Black-throated Blue, and Black-throated Green Warblers, Eastern Wood Pewees, and a Connecticut Warbler, just to name a few. 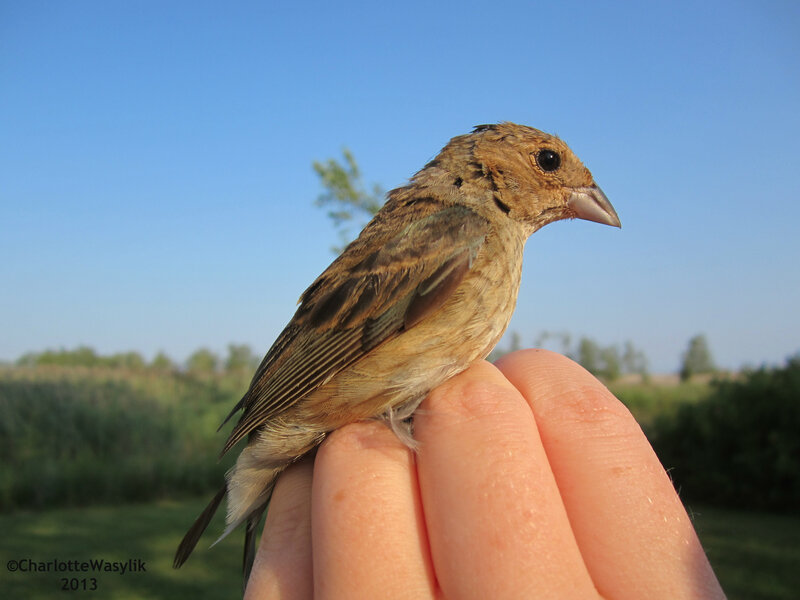 Because I was at Long Point for such a long time and we did so much, I haven’t included all of my daily journal entries, just some of the highlights (and this is just Part 1): I arrived at the Long Point Bird Observatory from Toronto on August 14th, in the morning. At Old Cut I met Dayna and Janice, LPBO staff who are both banders in charge, and volunteers Darren from New Zealand and Antje from Germany. In the late afternoon, I walked the census route to re-familiarize myself with the area, and in the evening some of us went to the dike behind Old Cut to count the thousands of Bank Swallows flying overhead. 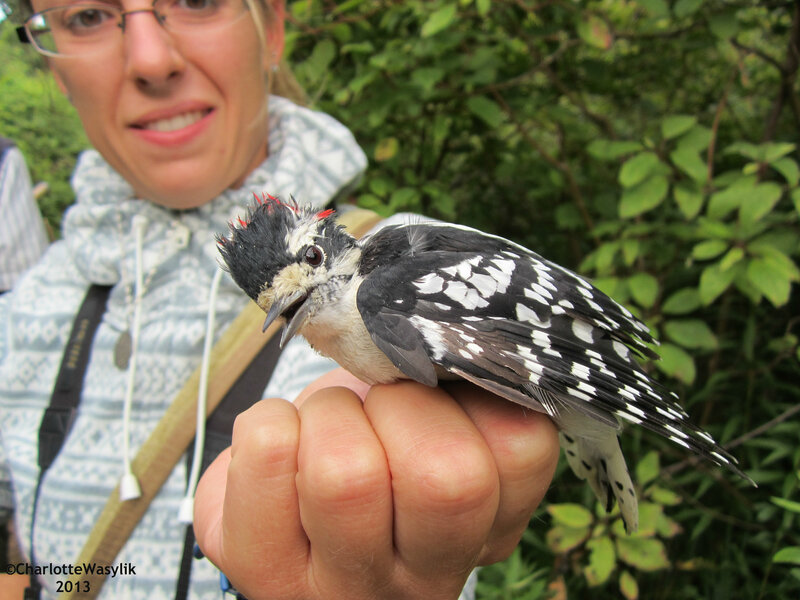 Antje with retrap male Downy Woodpecker at Old Cut, An Adult Yellow Warbler, August 16th: I’d been at Old Cut for only one day, and today Darren, Antje, Antoine, Christophe, and I boated out to the Tip. It was a great day for boating — the lake was calm and the sun was shining. When we got to the Tip, we unloaded the supplies and groceries, had a quick lunch, and set up the nets in the garden. As we were setting up one of the nets, we heard a Virginia Rail calling from the marsh — a lifer for me. We went for a walk on the census route, but passerine activity was fairly slow, though there were lots of birds at the very Tip including 3,000 Common Terns, 73 Herring Gulls, three Least Sandpipers, eight Semipalmated Sandpipers, and one Semipalmated Plover. The Tip’s Heligoland (funnel) trap was in need of some repair to the mesh, so the birds wouldn’t escape through the holes as they flew into the trap. 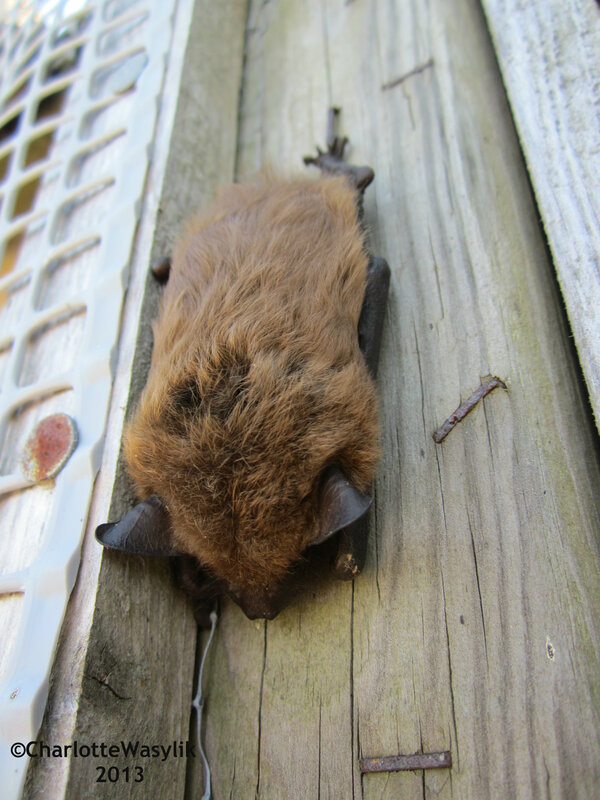 When we opened the door, we found this Little Brown Bat sleeping. 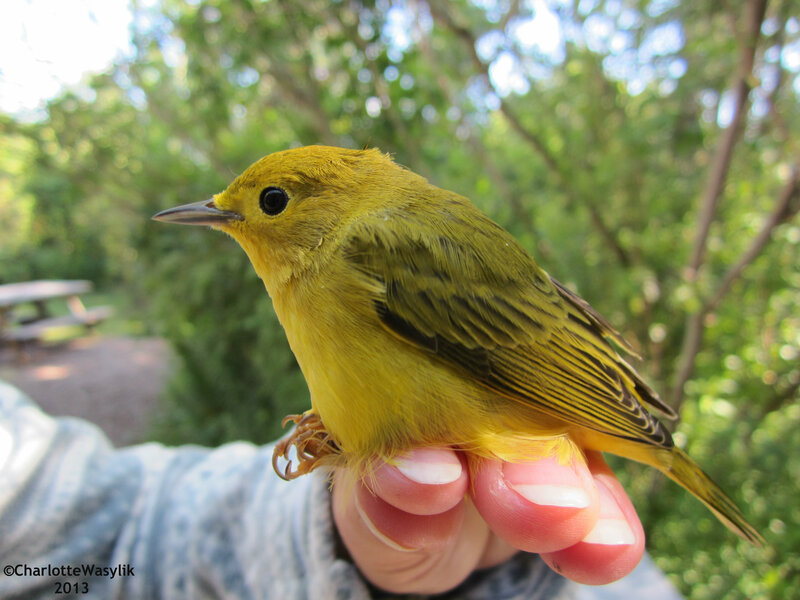 It didn’t move as we continued work on the HT, August 19th: On my way to check the mist nets this morning, I saw a Blackburnian Warbler in a poplar along with an American Redstart. 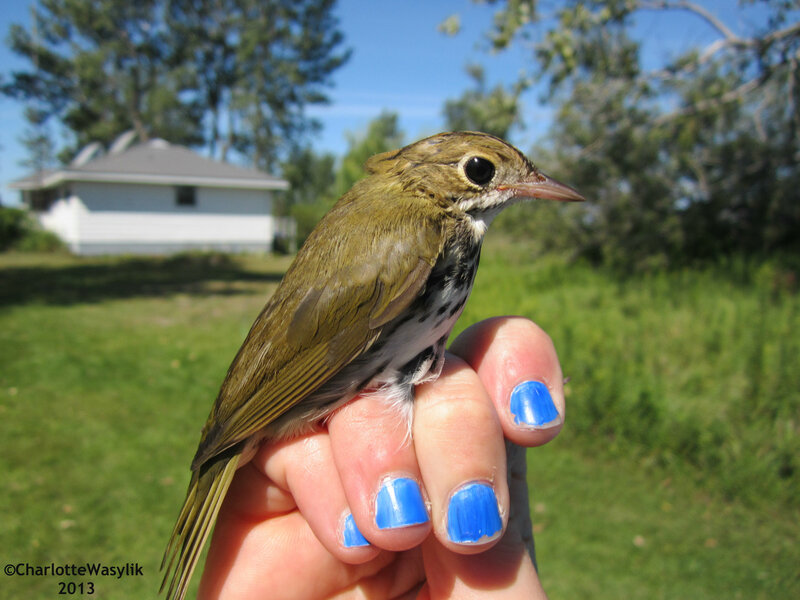 On my Monarch census for my research project, I found a Black-and-White Warbler and a Brown Thrasher. While swimming in the lake, an immature Ruddy Turnstone flew past with a flock of Least Sandpipers. After supper, Darren came inside to tell us that there was an American Woodcock near one of the nets so we all went out to look at it. 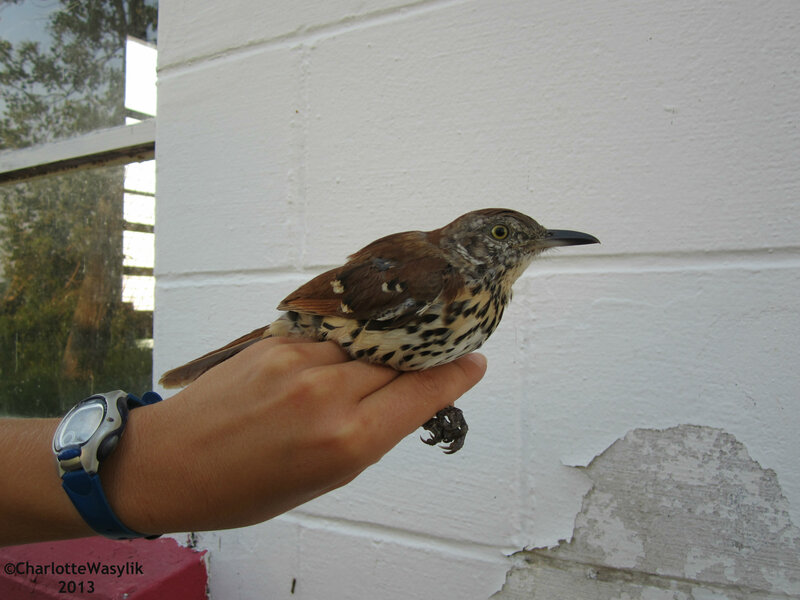 An Ovenbird, August 20th: It was very windy this morning, and because of that we had to close some of the nets early, but we caught a Black-billed Cuckoo in the Heligoland trap. We all drew net pegs to see who would band the bird and I was very excited when my peg was chosen. Unfortunately, this year the Monarch Butterfly population decreased dramatically so there weren’t as many Monarchs at the Tip as in previous years. During my stay at the Tip, I saw four pairs of Monarchs mating, A Bay-breasted Warbler, August 21st: When I was out at the Tip with Euan, a volunteer from Scotland, seven Willets landed on the beach, and as we were just about to leave, three American Avocets flew in. It was very neat to see both Willets and Avocets because they are fairly unusual species around Long Point. I added a new lifer to my list — a Great Black-backed Gull standing at the Tip with the Ring-billed Gulls. 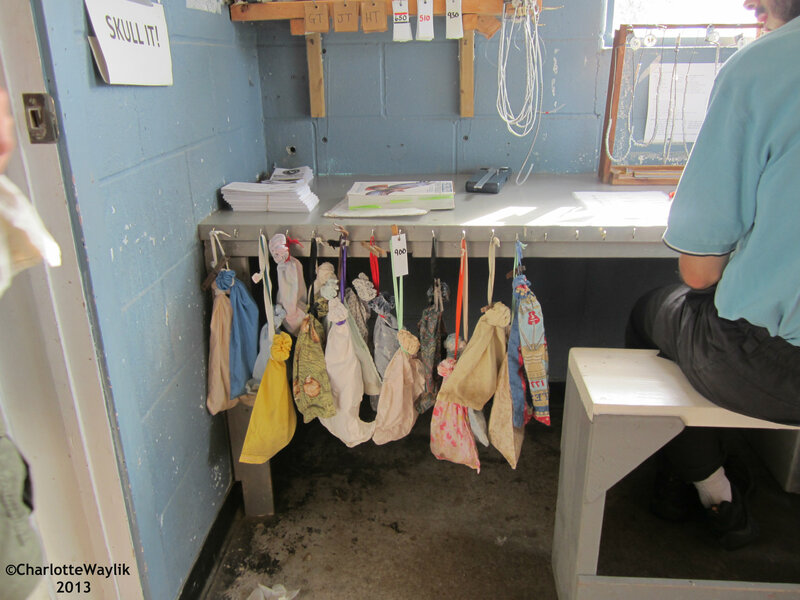 Birds waiting to be banded on one of our fairly busy days, A Great-crested Flycatcher, August 26th: We opened only one net this morning because of the strong winds but we did seven HT runs. We almost caught a Sora but it escaped through a hole in the mesh. 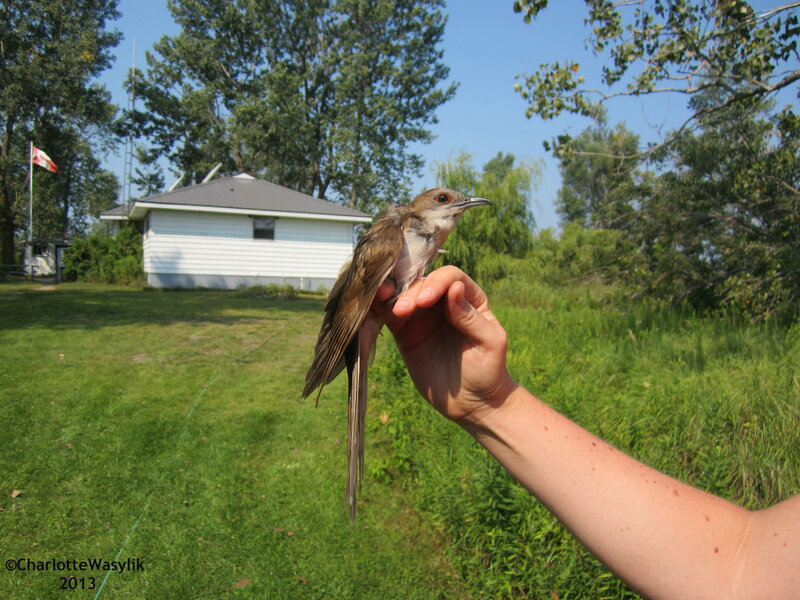 In our last HT run we caught a Yellow-billed Cuckoo! There was an immature Black-crowned Night Heron flying around, which then landed in some poplars. 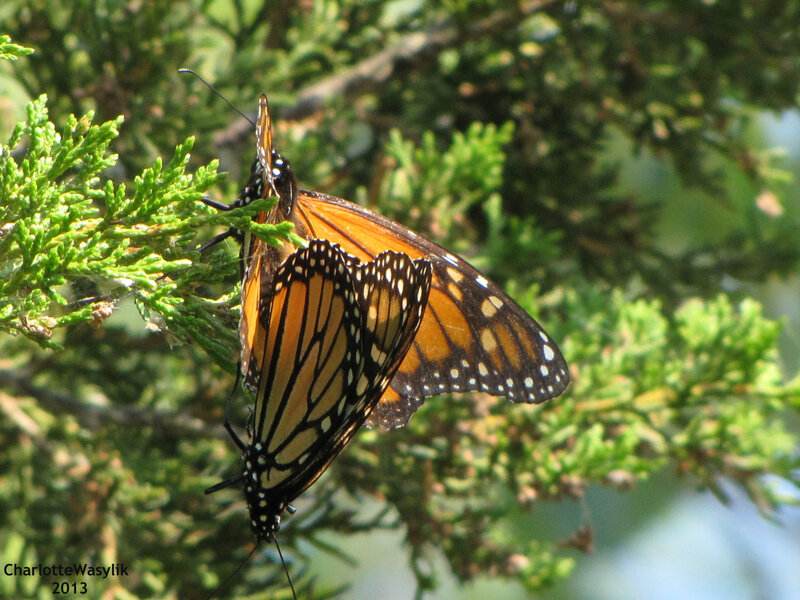 I saw 16 Monarchs on census, as well as two Ruby-throated Hummingbirds chasing a Red-winged Blackbird. A Brown Thrasher, Darren found this huge Bullfrog one night near the lighthouse and brought it back to show the rest of us, We caught this Blue-gray Gnatcatcher in the HT, but you need to have a special license to band gnatcatchers because their legs are so small; in fact, the smallest band LPBO has will fit right over a gnatcatcher leg. 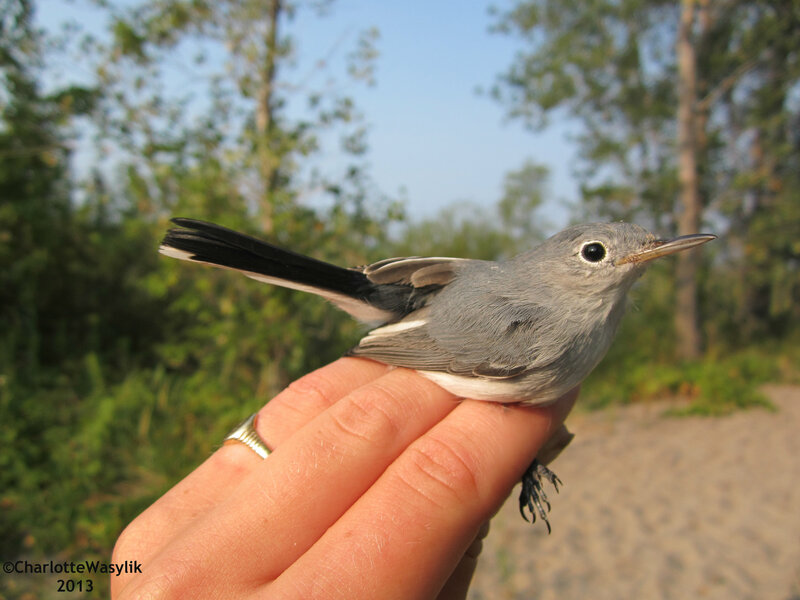 So if Blue-gray Gnatcatchers get caught at LPBO, they are released, August 28th: It was raining in the morning so we didn’t open the nets until 9:30. 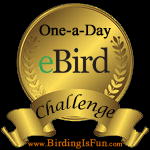 We all went on census and saw 42 species, with a flock of Cape May Warblers, a Canada Warbler, a Blackburnian, Tennessee, and Magnolias in some bushes. 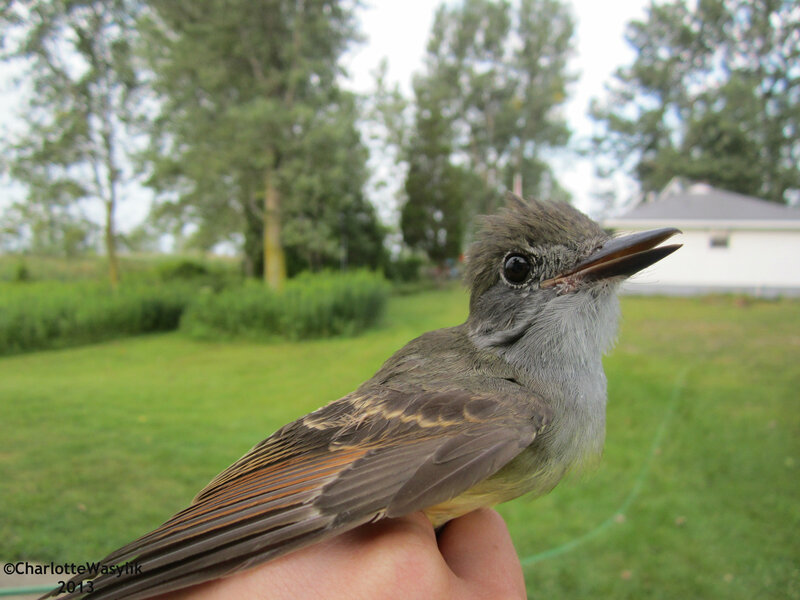 In the nets we caught a Western Wood Pewee which is a very rare species for Long Point. We took lots of photos and took a few feather samples. In the evening we did a supplementary census. It was really amazing to watch the thousands of gulls “hawking” for insects over the marsh. There were seven Common Nighthawks too. 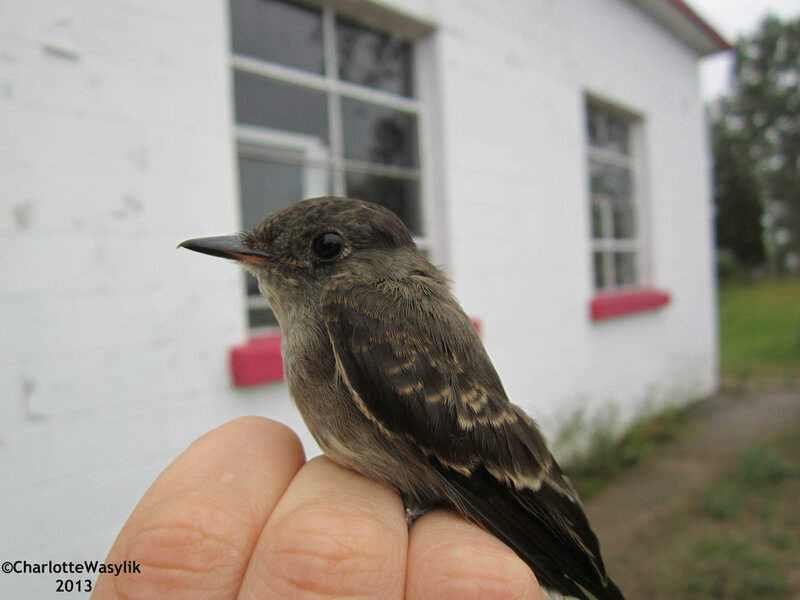 A Western Wood Pewee, Stay tuned for part two! I hope to get it up as soon possible.